I first became familiar with Wally Lamb when I read his novel She’s Come Undone many moons ago. It was an Oprah’s Book Club pick, and though I’m usually not subservient to the Big O’s charms, I decided to read Mr. Lamb’s novel and really liked it. I was delightfully surprised a man could write a female character with such understanding, richness and depth. Now years later, I am not surprised a male writer can do this, just as I’m not surprised a female writer can write a male character with the same talent and skill. All it takes is some common sense and some empathy, which are traits of good writers. 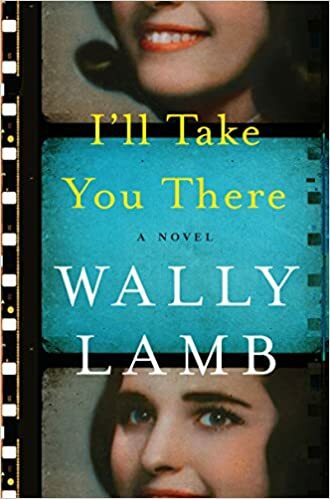 Now Lamb is back with his latest novel I’ll Take You There, which features one Felix Funicello, who was first introduced in Lamb’s early work Wishin’ and Hopin’. Felix Funicello (yes, he is related to the late Annette Funicello) is a film scholar. He has an affable relationship with his ex-wife Kat and is quite close with his daughter Aliza who is a feminist-minded writer for New York Magazine. On Monday nights, Felix hosts a Monday night film discussion group at an old vaudevillian theatre where he shows films from Hollywood’s earliest days. There are tales that old film legends haunt the dusty nooks and crannies of this old theater, but Felix figures that just a bunch of silliness until one night he is visited by the ghost of silent movie director Lois Weber and film star Billie Dove. At first, Felix thinks he’s going a bit nuts as most of us would if ghosts visited us. But soon Lois Weber is taking him on a nostalgic journey of both the heartbreak and bliss of Felix’s childhood. It is during this celluloid journey where Felix relives memories that at times are trivial and silly. But he also comes to grips with one memory that seared the very psyche of the Funicello family. One of Felix’s earliest memories is of watching the Disney move Pinocchio with his older sisters Frances and Simone. From this moment, Felix is hooked on movies and everything related to cinema and Hollywood. And somehow just knows the movies will impact him long before the final credits of Pinocchio scroll on the movie screen before him. Another early memory for a wee Felix is the Rheingold Beer search for a spokesmodel. Now remember, this is 1950s Brooklyn. You can’t vote for your favorite Rheingold Beer candidate via social media and the company’s website. You have to vote via a ballot box, and the winner gets a host of goodies and the possibility of fame and riches, how exciting! The Funicello children take it upon themselves to hustle up some votes for their favorite candidate Dulcet Tone, who they know better as Shirley Shishmanian, a local neighborhood gal. Miss Shishmanian changes her name because Shishamanian is way too ethnic, too Armenian. I have to admit this made me giggle considering today it’s a Kardashian world, and we just live in it. But darker times loom for Felix and his family. Frances develops a serious eating disorder that throws the Funicello’s into a distressing episode of confusion, despair and hopelessness. Felix also learns the truth about Frances’ birth, which involves a ne’er do well uncle and a fallen southern belle. And then there is Felix in the present. Just as his past is unfolding before him, his daughter Aliza is dealing with pressing issues, both professional and personal. One issue includes writing about the Rheingold Beer model search, a topic she finds rather unsettling as a committed feminist. However, the feature she does write is not one of self-indulgent finger-wagging. It is well-researched and nuanced and I really enjoyed reading it. She also makes decisions regarding her personal life that will bring true joy to both herself and her parents. Once again Wally Lamb has written a novel that is both thought-provoking and just a satisfying read. I’ll Take Your There, does just that, takes you there, which means in my case, reminds me why I love books so much.